The Huh? : Marvel & Netflix: Where's a She-Hulk Show? This is something I've wondered about for years. Ever since I read the Dan Slott and Juan Bobillo She-Hulk: Single Green Female I've wondered why she hasn't been given a show or film. Really, I'm not joking here. This series is a good read for many reasons, including having a multifaceted female lead. With Marvel's recent announcement with Netflix- it makes me curious as to why this hasn't been done. Daredevil, Luke Cage, Iron Fist, and Jessica Jones are all good characters, but they need a lady lead of She-Hulk caliber potential- strong in body and mind. She could be an amazing role model. Bobillo's unique art style could even be animated! What She-Hulk could ultimately offer to either the big or small screen is two fold- she has all the epic heroic deeds of being a super hero, but she would also offer the procedural courtroom drama of all the NCIS and CSI type shows airing continuously on pretty much ever channel possible. In addition to the seriousness, there would be plenty of humor and light-heartedness. I laughed for days about Spider-man taking J. Jonah Jameson to court for libel, and one reason he mentions for Jameson's actions uses the mask he wears to great effect. 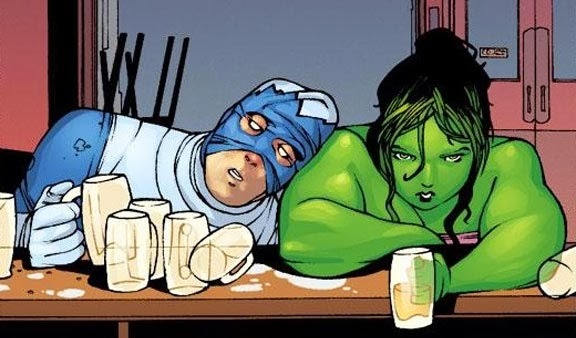 Due to excessive partying and recklessness She-Hulk demolishes both her home at the Avengers mansion and her future in Law. After being booted from the Avengers and getting fired from her law firm, She-Hulk gets picked up by meta-human law firm Goodman, Lieber, Kurtzberg & Holliway. The catch here is she isn't being hired to be muscle of any sort- she isn't getting a job as She-Hulk- but rather, she is being hired as her plain human alter ego Jennifer Walters, the professional lawyer. I can't recommend this as an "essential" read, but I would recommend this as something that should be read. It definitely deserves to be adapted for film/TV- even if it's just as a cartoon. There is something very special in this volume that should be shown to a wider audience. This story is the kind of thing that Agents of S.H.I.E.L.D. could've been doing already. A balance between both the human and superhuman aspects in a way that is entertaining and relatable. The story here doesn't have the fate of the world at stake- just a handful of lives. Villains that don't know what to do with themselves once they've gained power and need legal help for their previous actions, and Jennifer Walters herself dealing with the insecurities having to be a mundane lawyer instead of the fun and famous She-Hulk- and the crossing paths of both hero and villain realizing that sometimes being normal is better than being super.